The Mongolian people are composed largely of migrants who arrived in the 1990s and 2000s, as communism in Mongolia came to an end and restrictions on emigration were lifted. They also are students who came to study in universities yet remained in North America after graduation. Mongolian is not a single language, but rather a group of closely related languages spoken by the various tribes that make up the Mongolian people. Despite being diverse, Mongolian people collectively celebrate several major holidays. 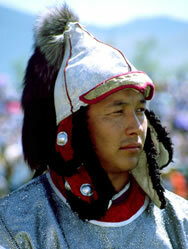 For instance, they celebrate Tsagaan Sar (White Month). Held over three days at the start of the lunar new year (in end of January or start of February), Tsagaan Sar celebrates the end of winter and the start of spring. Hence, Mongolians in the United States take pride in their Mongolian heritage and continue to pass on their Mongolian traditions and customs to their children. The majority of Mongolian people adhere to Buddhism. Pray Mongolian students will meet evangelical students at their university who will become their friends and share a clear message of Jesus Christ. Pray God will prepare the hearts and minds of Mongolian people to receive Jesus Christ as their one and only personal Savior.